- White chael M .
- Crawford rbara B . - Carr rgaret M .
- salazar zie s .
- Silva nnifer J . Republic Moving and Storage is a leader among San Diego’s top moving companies. At Republic we provide top-of-the-line moving and storage solutions for residential homes, military personnel, and commercial businesses throughout Southern California and the world. Through our 60 plus years of experience we have perfected the art of moving and storage. No move is too big or small for our qualified movers. At Republic Moving and Storage, we provide our services locally, long distance, or internationally. As a leader among local moving companies based in Chula Vista, CA, we specialize in providing fast, friendly, and safe moves at a cost you can afford. Our highly-trained, detail-oriented movers are the experts at helping you and your family or business relocate. At Republic Moving and Storage, we provide the most efficient moving plan by crafting a moving plan based on your specific timeline and needs. At Republic, we also work with you throughout the entire process, with everything from pre-move planning and packing to unpacking and installation services. Unlike other moving companies, from the moment you decide to relocate until the last box is unpacked, Republic Moving is there to provide you with the unparalleled moving and storage services you deserve! We are determined to make your move go as smooth as possible, so you can focus on settling in to your new location. Choose Republic Moving and Storage; professional movers, affordable prices and top rated services. 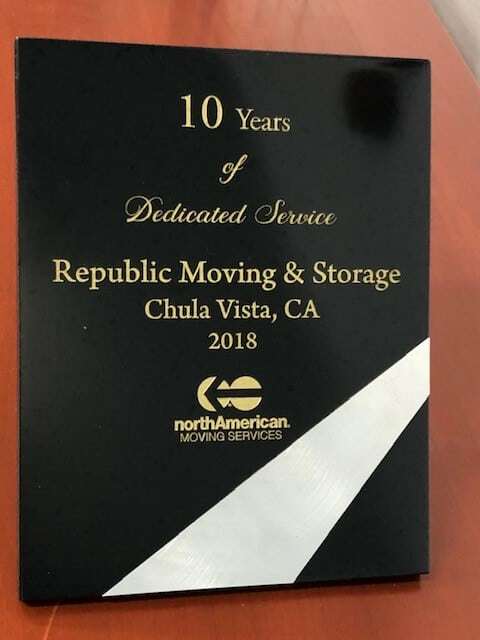 The team at Republic is proud to announce that our own Gary Bell will lead the San Diego chapter of the California Moving and Storage Association (CMSA) as the 2018-2019 chapter president. The role is a testament to the commitment that Republic Moving and Storage has in upholding the high industry standards and code of ethics set by CMSA. We are the top rated San Diego moving company that you can trust with your residential and commercial relocations. For more information about our services or to receive a free moving quote contact our professional movers today. We are ready and willing to help with all of your moving and storage needs. We are proud to have been with NAVL for 10 years! Looking forward to the next 10 as we continue to help families and businesses with our moving and storage solutions!